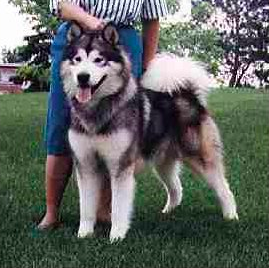 The Minnesota Malamute Club offers the following recommendations for those who are considering adding a Malamute to their lives. First and foremost, be sure you really do want a Malamute. This means researching the breed both online and speaking with owners and breeders. They are wonderful dogs, but they won't fit into all lifestyles. See "About Malamutes." What are the parents' temperaments? Neither should display signs of extreme aggression or extreme shyness. Will the breeder offer a contract with responsibilities clearly stated in the event problems arise? Are the puppies healthy and outgoing? Are they in a clean, well-maintained environment? Ask questions, visit the breeder's kennel, and find a breeder with whom you click. Be willing to wait for the right puppy. Responsible breeders do not have puppies available at all times. Be willing to be vetted by the breeder. A good breeder is going to ask a lot of questions to determine if you are "right" for one of his or her puppies. Think of it as an interview process, because indeed that is what it is. Banner: "Clara and Astro puppies." Karin Fischer.